Custom-Fit Over the Top Biminis by Monster Tower are designed to allow you more water time without the exhaustion from extensive sun exposure. Constructed from a strong, anodized aluminum frame and finished with the well-respected Sunbrella canvas, each Bimini is specifically made to fit your MT1, MT2, MTE, MTK, and HS1 tower. 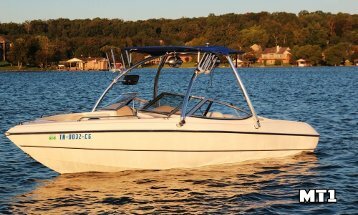 This Bimini top is 67" wide and 72" long and suitable for traveling purposes at speeds up to 45 mph. If you don't have a Monster Tower on your boat, but still want the protection from a quality made Tower Bimini, check out the Universal Cargo Bimini top which attaches under virtually any tower. 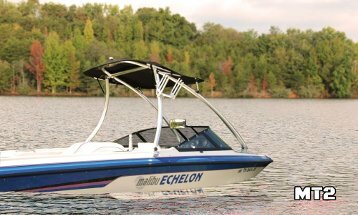 Protect your Tower and the interior of your boat with a sleek Bimini Top designed specifically for the MTE. Featuring polished, anodized tubing and superior hardware for optimal strength and beauty. This Bimini is easy to install and beautiful on your boat. Complete your MT1 Tower with a custom-made Bimini Top made from premium Sunbrella marine fabric. Choose from 9 colors to enhance the beauty and longevity of your boat. Easy to install and the canvas features a 10 year warranty. Custom-made for your tower's design, Monster's Over the Top Biminis provide extra headroom while protecting your tower and the interior of your boat. Stylish and durable features include polished and anodized tubing, superior hardware and Sunbrella fabric. 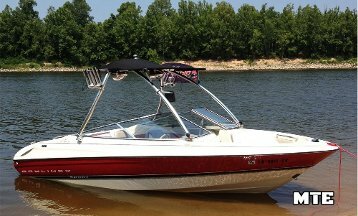 A Bimini Top designed specifically for the original MTK Tower with a 55" header. Protect your tower and your driver while surfing this season. Sleek and strong, this top is an asset to any boat and tower. Sunbrella canvas features a 10 year warranty. Shield your new MTK Tower and driver using an Over the Top Bimini, custom made for the MTK Tower with a 61" header. Take advantage of extra head space and the full width of your tower by choosing this top. 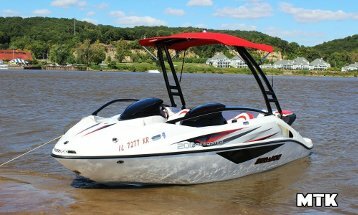 As with all Monster Bimini Tops, features include; polished anodized tubing, durable hardware and Sunbrella fabric to keep you cooler longer.